Two photos that show why North Korea isn’t going to be threatening anybody with nuclear missiles anytime soon. And one that shows why Kim Jong-Un is winning the insult battle. ▲ Check Orang Airport – 41°25’49.12″N – 129°38’45.95″E – on Google Earth. What are those aircraft you see there? They’re Mig-15s, Russian fighter aircraft that first flew in 1947. So a country with an air force flying 70-year-old aircraft, when they even have enough fuel to get them in the air, is going to launch a nuclear strike? Get a life! I flew in to Orang Airport, close to the North Korean coast and just south of the border with Russia and China, back in 2002 and saw those Mig-15 lined up along the runway, I even saw one of them flying. The Google Maps time line will show you the view of the airport since the turn of the century and in April 2017 those ancient aircraft were still lined up there. You can see more Mig-15 on Google Earth at Samjiyon Airport – 41°54’36.94″N – 128°25’26.46″E – but not so clearly. I flew in to Samjiyon in 2002 as well, it’s 120km inland from Orang. ▲ These bicycles in Shanghai have fallen over, they’re not dumped, but Google ‘dumped Chinese bicycles’ and you’ll quickly find photographs of thousands of the new Chinese ‘dockless’ rent-a-bikes dumped. They’ve churned out so many bicycles – millions of them – the authorities are rounding them up and dumping them to clear the sidewalks. In North Korea in 2002 I visited a Pyongyang department store where in the bicycle department they displayed North Korean manufactured bicycles. Fakes. When I checked bicycles on the street or in bicycle parks in Pyongyang they were all either Chinese or Japanese. Unwanted Japanese bicycles are often dumped at railway stations and periodically they’re collected up and exported to North Korea. So a country that can’t even make a bicycle is going to make an intercontinental missile? I don’t believe it. A recent South China Morning Post article speculated on where those North Korean missiles came from – either begged, borrowed or stolen old Russian technology or the same technology simply copied. Well rocket science is not exactly rocket science. The Russian Soyuz rockets which take Russian cosmonauts and American astronauts up to the International Space Station are based on a nearly 50-year-old design. Nothing new there and they even take tourists up to the space station as I saw (along with Mr Brin and Mr Page of Google) back in 2008. So I’m not losing sleep over fears of Mr Kim launching a missile attack on the USA, surely it would be easier to smuggle one in to the USA, rent a truck and deliver it that way? On the other hand Kim Jong-un is definitely winning the insult war with Donald Trump. 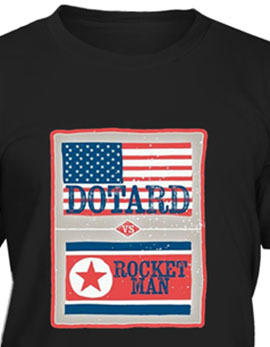 Offering to ‘surely and definitely tame the mentally deranged US dotard with fire’ is a far better insult than Mr Trump’s weak ‘rocket man.’ Perhaps neukdari – dotard in Korean – sounds even better? • You don’t frighten me Korean pig dog. Go and boil your bottom, son of a silly person. I blow my nose at you. I don’t want to talk to you no more, you empty-headed animal food trough wiper. I fart in your general direction. Your mother was a hamster and your father smelt of kimchi.